Mobile Cuisine is proud to provide our readers with another article designed to inform them about a multifaceted program that is spreading throughout the country. We have designated our Monday features to help promote the Meatless Mondays program which not only do we support on the website, but many of our our staff actually has adopted in our Monday dietary lifestyle. 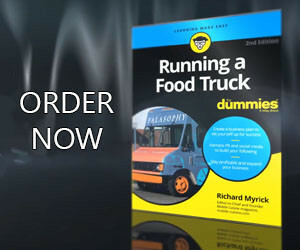 Today we look at helping consumers find protein on food truck menus without being forced to order a dish with meat. Proteins are an important building block for your hair, skin, nails, muscles, hormones, blood, and immunity. You cannot survive without proteins. Legumes are also called dried beans are edible seeds that grow in pods. Examples are chickpeas, split peas, haricot, lentils (red, green or brown), kidney beans etc. Nuts are fruits that have a hard outer shell that encloses a kernel, which is also called a nut. Seeds are contained in fruits of plants and are capable of reproducing a new plant. Many nuts and seeds are available both in and out of the shell, whole, halved, sliced, chopped, raw, or roasted example are cashew, peanuts, walnuts, almonds. Dairy foods are products made from milk, the liquid secreted by female mammals for suckling their young. Choose nonfat or low-fat milk, yogurt and cheese for daily consumption. Save high-fat cheeses and ice cream for occasional treats. Grains are the seeds or fruit of cereal plants, used as food by humans and animals. Choose whole grain flours, cereals, wheat & rye breads, buckwheat pancakes, muffins & scones, noodles and pasta. Check the nutritional facts panel on the label for fat, sugar, and additives. Eat grain with complementary protein. Experiment with high quality grains, such as amaranth and quinoa. A versatile bean use extensively in cooking, the soybean also serves as the basis for a wide variety of soya foods consumed. Soybeans are the richest plant source of high-quality protein. The most common soya form is still tofu, but today, the soybean takes on many other forms, including burgers, dogs, bacon, sausage, and many other meat substitutes. Seitan has been used in Asia as a protein source and meat substitute for hundreds of years. It can be prepared from scratch using whole-wheat flour. The flour is mixed with enough water to make into a dough that is then kneaded in water and rinsed to remove the starch and the bran. The protein, or gluten, remains and is then simmered in a broth flavored with soya sauce to become seitan. The longer the gluten simmers, the more firm it becomes. Seitan can then be sliced for sautés or stir-fries, diced into stews, soups, or casseroles, or formed into roasts. People who are allergic to wheat or wheat gluten should avoid seitan. Do not use if you are gluten-sensitive. A good source of protein delivering 23g/30 gms of Seitan. Vitamins are loaded with vitamins and minerals essential for varied body processes and have been shown to provide protection against a variety of illnesses. Textured vegetable protein is also a good substitute for ground beef in dishes such as tacos, chilli, and stews. Brown or white? Either and both is a source of complete protein. The color of the egg’s shell is simply an indicator of the breed of hen that laid the egg. Eggs yolks are among the few foods that contain vitamin D. Eggs are the centerpiece of a range of foods. Many egg dishes, such as omelets and frittatas, can be prepared quickly with many interesting fillings, such as peppers, tomatoes, or zucchini. Consumers choosing to follow a Meatless Monday lifestyle don’t need to worry about avoiding food trucks. Even if a truck’s primary focus is meat for protein, you still have many options to fill up without ordering a dish with meat. We hope that those of you that have avoided joining this movement because of the protein fallacies you’ve been taught over the years, can take the information from this article, to help yourself take a healthy step the next time you are planning to find a food truck on Monday.